The chiropractor. A lot of people swear by chiropractic treatments as the only way they get relief from back pain, neck pain, headaches, and a host of joint problems. Others aren’t so sure about this holistic wellness discipline. Regardless of what camp you’re in, allow us to demystify this type of care for you. That’s right, a Doctor of Chiropractic (DC) studies for four years of undergraduate and four years of chiropractic school, using similar books that MDs use for study, says Scott Bautch, DC, president of the council on occupational health for the American Chiropractic Association. Chiropractors must also pass a licensure test and take continuing education courses to stay abreast of the latest trends in their field and maintain their credentials. People mostly see chiropractors for pain relief, but it’s becoming more popular to see a chiropractor for general wellness. “Chiropractors are increasingly becoming overall wellness advisors — advising patients about their eating , exercise, and sleeping habits,” Bautch says. Since chiropractors focus on the health of the nervous system, particularly the spinal cord, they are treating the entire body. Therefore, they are addressing both acute injuries (such as low back pain), as well as general, chronic issues (such as fatigue). Chiropractors use comprehensive intake screenings to learn not just about what ails you, but also to get a complete picture of your overall health (hence the “holistic” descriptor). This will include health history questionnaires as well as functional and neurological assessments to see how your body moves, how well you can balance, etc. The doctor may also take x-rays. Finally, there will be a discussion about cost and course of treatment. In most cases, people see chiropractors for acute injuries (like throwing your back out) or chronic conditions (like headaches), so it may take a few of weeks of multiple visits to stabilize the problem. After a few weeks of multiple treatments per week, treatment tapers gradually to once per week, then once per month for maintenance, until the spine is able to stay in alignment without the chiropractor’s adjustments. The course of treatment and length of time until stabilization vary from person to person. There’s a general belief that chiropractors want to make you reliant on them, but Bautch and Burns believe otherwise. “There are three phase of care,” Bautch says. “Acute — let’s get you functional; corrective — let’s adjust you so that it doesn’t happen again or as frequently; and then maintenance — maybe down to once a month.” Indeed, this is what Burns experienced — but he also learned the hard way the importance of self-maintenance. “Chiropractors take the approach of ‘let me teach you how to fish,’ not ‘let me just give you the fish,’” says Burns. He, like most patients, was given exercises to compliment and maintain his recovery — and he only ran into trouble again once he stopped doing them. “If I skip my exercises, sure enough, my lower back gets tight,” Burns says. Planks are one of the hardest exercises to get right. Yet, most of us incorporate planks into our workouts, whether it’s running, lifting or doing bootcamp. What many of us don’t realize is we’re planking all wrong. Here, learn how to maximize the perks of this exercise staple. Most exercises can benefit from a bit of glute engagement, and planks are no exception. “Squeezing your glutes causes a bit of a stretch in your hip flexors, which transfers more of the workload to the abdominal muscles,” explains Greg Pignataro, certified strength and conditioning coach at Grindset Fitness. And your abdominal muscles are what you’re trying to work, right? “Additionally, contracting the glutes will reduce strain on your lumbar spine by preventing your lower back from sagging,” Pignataro adds. Seriously. “Dr. Stuart McGill, a professor from the university of Waterloo who has spent 30+ years researching the spine and back pain, touts groundbreaking research about core ‘stiffness,’” Verstegen notes. “Holding planks for 10 seconds at high tension followed by a brief rest period before the next rep creates a much stronger core with fewer injuries. “Pavel Tsatsouline, most famous for popularizing kettlebell training, agrees. He designed the ‘RKC’ plank around this philosophy of full-body stiffness and also promotes shorter, stronger plank holds.” Try doing a set of 3–10-second holds with maximum contraction for the best core strength gains. “To make your planks count, every muscle needed to stabilize your spine is firing at a maximal effort,” says Kari Woodall, owner of BLAZE. Doing so can even even help with your preferred method of exercise. “If I want to crush my deadlifts, I need the requisite core strength to pick up something heavy. If my body doesn’t understand what a maximal contraction feels like, then I am not only limiting how much I can lift, but I’m increasing my risk of injury if I do pick up something heavy,” she explains. Not feeling the burn? “Squeeze your armpits like you have million-dollar bills tucked underneath each one, and you get to keep the money if no one can rip them away from you,” Woodall adds. Summer is the time to get outdoors and enjoy everything the season has to offer. As a kid, summers were always my favorite. And it wasn’t just because school was out. Sure, some days could be unbearably hot and humid, but there was nothing better than spending hours on a blanket reading in the grassy backyard (or on the roof—sorry Mom and Dad), running after fireflies, or, on those particularly sticky days, heading inside. Every day, about 30 minutes before stepping out, apply 1 ounce (2 tablespoons) of broad spectrum SPF of at least 30. Sun damage to the skin is caused by two types of rays: UVA and UVB. UVB rays are the primary cause of sunburn, but they each play a role in skin-aging and increasing your risk of skin cancer, so you want to protect yourself against both. Standard SPF (sun protection factor) blocks only UVB rays. Broad (or multi-spectrum) sunscreen protects against both. 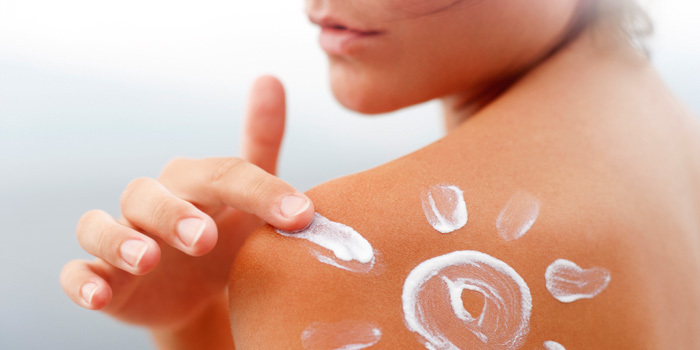 When it comes to sunscreen, the higher the SPF the better, right? Eh. SPF 15 blocks approximately 93% of UVB rays. SPF 30 blocks 97% and SPF 45 blocks 98%. Higher isn’t necessarily better, so don’t be lulled into a false sense of security that SPF 100 is going to protect you all day. Reapply your sunscreen every two hours. And, don’t skimp on it. Use the same amount – at least 1 ounce – every time you do. Less than that and you’re not getting the full protection it offers. Reapply immediately after swimming, sweating a lot, or toweling off. Water-resistant sunscreen is effective for 40 minutes in the water. Very water resistant is effective for 80 minutes of swimming. There is no such thing as truly waterproof or sweatproof sunscreen. Use your sunscreen daily, year-round, even on grey days as the UVA and UVB rays are still hitting your skin, but don’t keep it beyond the expiration date. It starts to degrade and become less effective. I realize that avoiding the hours between 10 AM and 4 PM, and wearing a hat, sunglasses, and tightly-knit dark long-sleeved shirts and pants every summer day is not a reasonable request. But, it is what the CDC recommends. At the very least, limit your sun exposure during those hours, wear a hat and UV protective sunglasses, and be mindful about wearing sunscreen.